Zombie blood is supposed to be gross, but not this gross. A company that sells the novelty beverage “Zombie Blood,” green fluid sold in an IV style package, is suing the firms that manufacture and package the drink, claiming errors made the product stink and the bags explode. 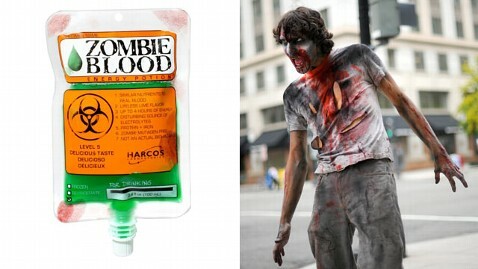 Harcos Labs, which sells Zombie Blood and the similarly packaged red beverage aptly known as “Blood,” accuses the companies Primal essence, Power Brands Consultants, American Bottling, and Silliker, which tests products, of using the wrong ingredients, resulting in the product’s foul smell and spoilage. “A number of initial production runs of the ‘Blood’ and ‘Zombie Blood’ met with a phenomenal success, they virtually flew off the shelves at such retailers as Hot Topic and sold out quickly,” Harcos said in its suit against the other firms. ” However, in late August 2010, Harcos first learned of the complaints of the Zombie Blood product tasting ‘like yogurt.’ In late September 2010, Harcos first learned of the complaints of the Blood product having expanding and exploding pouches and foul smell,” according to the document. Harcos accuses Power Brands of improperly adding a protein to the beverage mixture during production. “Said protein caused growth of microbial organisms and caused the products to, in layman’s terms, spoil. This resulted in failure of the Blood and Zombie Blood products in the marketplace and damages to Harcos,” according to the suit. Harcos is suing for unspecified damages. Calls to companies named the suit, which was filed July 3 in Orange County, Calif., Court, were not immediately returned.